Patchy particles are building blocks, whose broken symmetry – often realized through surface patterns with different interaction potentials – induces directional aggregation behavior that is fundamentally different from well-known colloidal crystallization. Due to the many possibilities to manipulate the assembly behavior of patchy particles, they have gained notable attention. For the last 5-10 years, ground-breaking articles have been published on a monthly basis in renowned scientific journals with interdisciplinary readership (e.g. Science, Nature). Today, most research efforts focus on microscopic particles (usually 0.5 µm-2 µm), because methods to pattern their rather large surfaces are straightforward, and characterization of superstructures is realized with simple techniques (e.g. optical microscopy). However, the resolution of the superstructures is directly linked to the size of their building blocks, with the current limit of most systems being in the range of a few 100 nm. To overcome this limitation, smaller particles are essential. 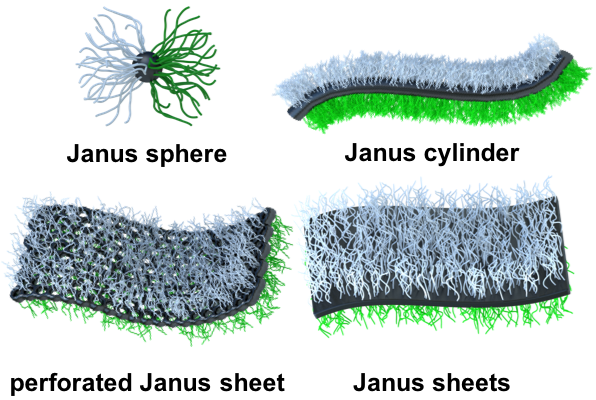 This requires innovative particle design on the nanoscale combined with conceptual approaches to decorate them with even smaller surface patterns. Particles with two hemispheres of different chemical properties are the simplest patchy particle and referred to as Janus particle. Theoretical and experimental works have shown that this type of particle displays a very high affinity to interfaces with strong interfacial stabilization capability, making Janus particles potentially attractive for a variety of applications (colloidal surfactants). Soft Janus nanoparticles usually are sub-100 nm in size, consist of polymer phases, and have been realized as spherical Janus micelles, cylinders and sheets (also discs). We also utilized confinement-assembly (see here) to direct ABC triblock terpolymer morphologies into several new Janus nanoparticle species. Any Janus particle synthesis seeks to break the symmetry of the particle by decorating the surface selectively with incompatible materials, e.g. molecules, polymers or inorganics. For microparticles this is usually done at interfaces followed by modification of one hemisphere. Examples are monolayer deposition and stamping or sputtering, adsorbing microparticles to emulsions, wax particles or the air/water interface. Using our novel hierarchical self-assembly of ABC triblock terpolymers to precisely defined multicompartment micelles (MCMs), we developed an alternative route for large scale synthesis of spherical polymeric Janus nanoparticles. ABC triblock terpolymers are intrinsically asymmetric due to the different end blocks A and C. We exploit the fact that during self-assembly of the triblock, block A is completely insoluble within the MCM core, while block C is soluble. this situation lead to a complete separation of blocks A and C. Cross-linking of the B patch permanently locks in this separation due to the covalent linkage of chains A and C to the core, and redispersion separates individual Janus nanoparticles. In our paper we could show that this route is suitable for a range of block chemistries, it allows to control the Janus balance (solvophilic-to-solvophobic balance), and can be scaled up to polymer concentration of 100 g/L. Janus particles are generally known for their high affinity to interfaces. This is in part attributed to the Pickering effect of colloids at interfaces and in part to the amphiphilicity of the Janus character. While Janus microparticles have been demonstrated to efficiently stabilize emulsions, the compatibilization of polymer blends, i.e. mixtures of homopolymers, have remained challenging. To obtain homogeneous averaging of material properties of the blended polymers, small domain sizes are beneficial, which in turn largely increases unwanted (energetic) interface between the polymers. We reported on the ability of polymer-based Janus nanoparticles with core-sizes of 10-50 nm to effectively stabilize polymer blends of poly(oxy-2,6-dimethyl-1,4-phenylen) and poly(styrene-co-acrylonitrile). Polymer Janus nanoparticles may consist to large extend of dissolved PS/PMMA corona patches that entangle with the blended phases and thereby enhance compatibilization (e.g. PS is miscible with PPE). We synthesized several 100 g of Janus nanoparticles and compatibilized PPE/SAN blends in a Brabender extrusion equipment with a throughput of 1kg/h adding various weight fractions of particles (up to 10 wt%). We could show that the obtained morphology changes with added weight fraction of added Janus nanoparticles from a bicontinuous microblend to a nanoblend with PPE droplets in SAN. Interestingly, the particles are able to diffuse through the viscous polymer melt and selectively accumulate at the polymer/polymer interface despite the harsh conditions during extrusion. The produced PPE droplets do not fuse together even under deformation as visible from dense packing. The strong interfacial stabilization is provided by the Janus nanoparticles that can be identified as small black spots after selective staining in TEM. The design of Janus nanoparticles for large scale application is an important step to bring this material class to technological relevance. Particles with two hemispheres of different chemical properties are the simplest patchy particle and referred to as Janus particle. Theoretical and experimental works have shown that this type of particle displays a very high affinity to interfaces with strong interfacial stabilization capability, making Janus particles potentially attractive for a variety of applications (colloidal surfactants). Soft Janus nanoparticles usually are sub-100nm in size, consist of polymer phases, and have been realized as spherical Janus micelles, cylinders and sheets (also discs). In a recent work, we expanded the family of soft Janus nanostructures about perforated Janus nanomembranes featuring a PS and PtBMA side, a thickness of only 13nm and homogeneous pore size distribution centering around 25nm. We also utilized confinement assembly (see above) to direct ABC triblock terpolymer morphologies into several new Janus nanoparticle species. In a recent work, we expanded the family of soft Janus nanostructures about perforated Janus nanomembranes featuring a PS and PtBMA side, a thickness of only 13 nm and homogeneous pore size distribution centering around 25 nm. We were able to form bulk morphologies of polystyrene-b-poly(4-vinylpyridine)-b-poly(tert-butyl methacrylate) triblock terpolymers with cylinder lamella morphologies. The poly(4-vinylpyridine) middle block thereby can be post-modified through supramolecular hydrogen bonding. We case bulk morphologies of three SVT terpolymers with different weight fraction of the middle block and changes the morphology with azobenzene hydrogen-binding. These hydrogen-binding motifs attach to the aromatic nitrogen and thereby change polarity, volume and chain stretching of the blocks. As a result, we obtained lamella-lamella morphologies with ultrathin P4VP/azo domains as evidenced in TEM and SAXS measurements. In SAXS we could index peaks for lamellae up to the 9th order suggesting highly aligned domains. Surprisingly, after cross-linking of the P4VP domains with a biiodides, we obtained hexagonally perforated sheets for some samples. 21. Controlling the shape of Janus nanostructures through supramolecular modification of ABC terpolymer bulk morphologies, P. Hiekkataipale, T.I. Löbling, M. Poutanen, A. Priimägi, O. Ikkala*, A.H. Gröschel*, Polymer, 2016, 107, 456–465. (invited to Special Issue “Polymer Self-assembly”). 19. “Patchy" carbon nanotubes as efficient compatibilizers for polymer blends T. Gegenhuber, M. Krekhova, J. Schöbel, A.H. Gröschel*, H. Schmalz*, ACS Macro Lett., 2016, 5, 306–310. 18. Noncovalent grafting of carbon nanotubes with triblock terpolymers: Toward patchy 1D hybrids T. Gegenhuber, A.H. Gröschel, T. I. Löbling, M. Drechsler, S. Ehlert, S. Förster, H. Schmalz*, Macromolecules, 2015, 48, 1767–1776. Selected as Cover for issue 6 (2015). 14. The Impact of Janus nanoparticles on immiscible polymer blends under technologically relevant conditions, R. Bahrami, T.I. Löbling, A.H. Gröschel, H. Schmalz, A.H.E. Müller*, V. Altstädt, ACS Nano, 2014, 8, 10048–10056. (Featured in “News&Views” Science, 2014, 346, 436–437). 6. 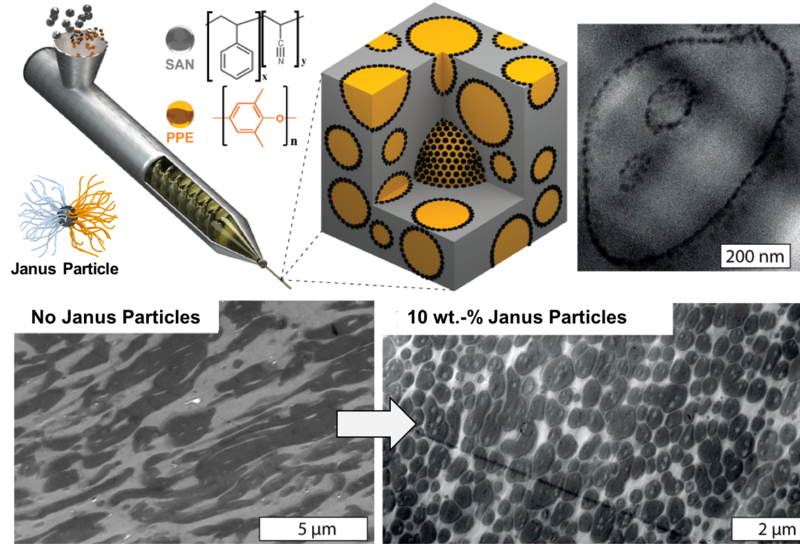 Facile, solution-based synthesis of soft, nanoscale Janus particles with tunable Janus balance, A.H. Gröschel*, A. Walther, J. Schmelz, A. Hanisch, H. Schmalz, A.H.E. Müller*, J. Am. Chem. Soc., 2012, 134, 13850–13860.